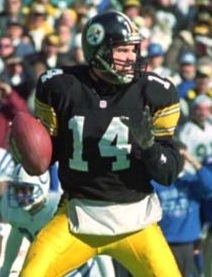 The Pittsburgh Steelers were hosting the AFC Championship game for the second straight year as they faced the Indianapolis Colts on January 14, 1996. Head Coach Bill Cowher’s team had been upset in stunning fashion by San Diego in the conference title game following the 1994 season and was looking to erase that memory. 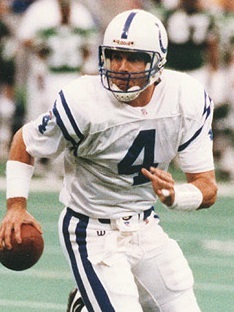 The conservative offense was efficiently directed by QB Neil O’Donnell (pictured at right), but it was the strong defense that was the key to success, despite the loss of star CB Rod Woodson in the season’s first game. Outside linebackers Kevin Greene and Greg Lloyd were both Pro Bowlers, as was CB Carnell Lake, who had been shifted from strong safety, and CB Willie Williams led the AFC with seven interceptions. After getting off to a 3-4 start, the Steelers hit stride by reeling off eight straight wins to top the AFC Central with an 11-5 record and defeated Buffalo in the Divisional playoff round. Indianapolis was in the playoffs for the first time since 1987. Coached by Ted Marchibroda, who was in the fourth season of his second stint with the franchise, the Colts placed second in the AFC East at 9-7 and defeated San Diego and Kansas City on the road to reach the conference title game. QB Jim Harbaugh, formerly of the Bears and relegated to the bench early in the ’95 season in Indianapolis, had a career year, leading the NFL in passing and earning Pro Bowl honors. RB Marshall Faulk gained 1553 yards from scrimmage and also was a Pro Bowl choice, but he was out for the postseason with a knee injury. The defensive line was tough with DE Tony Bennett and tackles Tony Siragusa and Tony McCoy and the corps of linebackers, led by OLB Quentin Coryatt, was a good one. Still, the Colts had the look of an overachieving team and were 11-point underdogs against the Steelers. There were 61,062 fans in attendance on a sunny and mild day at Three Rivers Stadium. The Steelers had the ball first but, on their third play from scrimmage, a pass by Neil O’Donnell was tipped by DT Tony Siragusa and intercepted by LB Jeff Herrod, who returned it 17 yards to the Pittsburgh 24. Three running plays netted seven yards and Cary Blanchard kicked a 34-yard field goal that gave the Colts an early 3-0 lead. The teams traded punts before the Steelers put together a 40-yard drive in 11 plays. O’Donnell converted a third-and-six situation with a throw to RB John L. Williams for seven yards and he completed four other passes before the advance stalled at the Indianapolis 13 and Norm Johnson tied the game with a 31-yard field goal. The Colts had the ball as the game headed into the second quarter. Jim Harbaugh (pictured at left) completed his first four passes, the longest to WR Sean Dawkins for 30 yards, and after a third down toss into the end zone under pressure from Kevin Greene was incomplete, Blanchard came on again to boot another field goal, this time from 36 yards. Each team had a short series that resulted in a punt before Pittsburgh put together an 80-yard possession in 17 plays. O’Donnell had eight completions along the way, only one of which was longer than ten yards, during the methodical drive in which the Steelers converted four third downs. The last was on a five-yard touchdown pass from O’Donnell to QB/WR Kordell Stewart with 13 seconds remaining in the first half, although replays indicated that Stewart appeared to have stepped out of the back of the end zone before making the catch. Johnson added the extra point and the home team took a 10-6 lead into halftime. Indianapolis took the second half kickoff and drove 61 yards in 10 plays. Harbaugh started off with a pass to TE Ken Dilger for 30 yards and followed up with a 14-yard completion to Dawkins. After reaching the Pittsburgh 12, Harbaugh was sacked by Greg Lloyd for a loss of eight yards on second down and, two plays later, Blanchard kicked a 37-yard field goal that made it a one-point contest at 10-9. A short series by the Steelers ended with a punt and the Colts put together another promising drive. Harbaugh converted a third-and-six situation with a throw to Dawkins for 13 yards and converted another with a two-yard run. This time the advance was halted at the Pittsburgh 30 and the visitors came up empty when Blanchard was wide to the left on a 47-yard field goal attempt. The Steelers responded by moving 44 yards in seven plays. O’Donnell threw to WR Yancey Thigpen for 14 yards and a pass interference call was good for 16 yards. The series resulted in a 36-yard Johnson field goal and Pittsburgh took a 13-9 lead into the fourth quarter. Indianapolis went three-and-out on its next possession and WR Andre Hastings returned the resulting punt 33 yards to the Colts’ 42. O’Donnell passed the Steelers to the 22, but Johnson failed on a 40-yard field goal try. The Colts came back with Harbaugh firing two passes to RB Lamont Warren for a total of 13 yards and a completion to RB Zack Crockett gained another 10 before Harbaugh connected with WR Floyd Turner for a 47-yard touchdown. Blanchard converted and the visitors were back in the lead by a 16-13 score. The teams exchanged punts, with Indianapolis failing to convert a third-and-one situation thanks to an alert play by Willie Williams to tackle Warren for no gain, and the Steelers, regaining possession at their 33, advanced 67 yards in eight plays. O’Donnell hit on his first two passes, missed on two (one of which was nearly intercepted), and then threw complete to Hastings for nine yards to convert a fourth-and-three situation. O’Donnell’s next pass was to WR Ernie Mills, who just beat CB Ashley Ambrose and kept his feet inbounds for a 37-yard gain to the Indianapolis one and, two plays later, RB Bam Morris scored from there. Johnson added the point after and Pittsburgh was ahead by four points with 1:34 remaining to play. Starting from their 16 after the ensuing kickoff, the Colts moved down the field as Harbaugh went to the air on every play. A third-and-three pass to WR Brian Stablein gained 18 yards and, facing fourth-and-two at the Indianapolis 49, Harbaugh connected with Dawkins for 13 yards. Harbaugh ran for nine yards and then had to spike the ball with six seconds left at the Pittsburgh 29. A final throw into the end zone was tipped by FS Darren Perry and fell onto WR Aaron Bailey, who was on the ground. However, he was unable to maintain possession and the Steelers came away with a closely-fought 20-16 win. The Colts had more total yards (328 to 285) but Pittsburgh led in first downs (21 to 16). The Steelers had three sacks, to one by Indianapolis, but also gave up the game’s only turnover. Neil O’Donnell completed 25 of 41 passes for 205 yards and a touchdown while being intercepted once. Yancey Thigpen had 6 catches for 65 yards and Ernie Mills gained 52 yards on three receptions that included the big one to set up the game-winning TD. RB Erric Pegram topped the Pittsburgh rushers with 46 yards on 10 carries. For the Colts, Jim Harbaugh was successful on 21 of 33 throws for 267 yards and a TD with none picked off and ran the ball six times for 29 yards. Sean Dawkins (pictured at right) caught 7 passes for 96 yards and Lamont Warren had 7 receptions as well, for 37 yards, in addition to leading the club in rushing with 53 yards on 15 attempts. Pittsburgh went on to lose the Super Bowl to the Dallas Cowboys. While there were significant personnel changes during the offseason, the Steelers came back to top the AFC Central again in 1996 but lost in the Divisional playoff round. 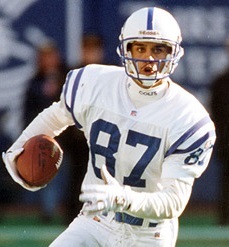 The Colts also underwent changes, most notably the departure of Coach Marchibroda, but they again compiled a 9-7 record and qualified for a Wild Card playoff spot. They met up with the Steelers in the first round and were soundly defeated.